Indian-based Formula E Team Mahindra Racing has today (5, February) taken the wraps off its official team livery during the opening day of the Delhi Motor Show. In front of a packed crowd of invited guests and media, the electric vehicle maker revealed a striking red and white colour scheme for its fully-electric SRT_01E race car which will compete in the forthcoming FIA Formula E Championship. Mahindra Racing is one of 10 teams to have signed up to the new electric race series which begins in Beijing in September. Led by Team Principal Dilbagh Gill, the Mumbai outfit is no stranger to international motorsport competing in the MotoGP™ World Championship. 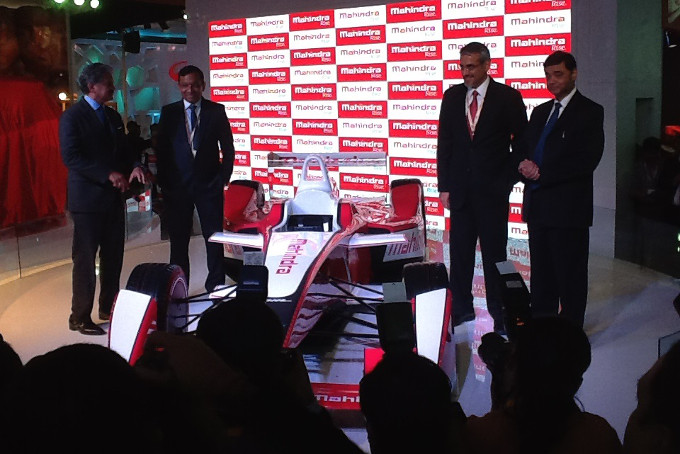 As well as the unveiling the team’s racing colours, the event also saw Mahindra showcase a range of electric vehicles. "We have been working a lot on next generation electric vehicle technologies, which we will be showcasing in the five products we will display at the Auto Expo," said Mahindra Reva Founder and CEO Chetan Maini. "Our aim has been to trickle down technology from such Formula E cars for commercial use and we are hopeful that in the next few years there will be a lot of cross pollination of technology," he added.